Young adults may be savvy with technology, but they're not tapping its full potential to protect themselves against credit card fraud, a recent study says. Javelin Strategy & Research in San Francisco found that 18- to 24-year-olds took twice as many days to detect identity fraud in 2009 than other age groups. Why? They were the least likely group to monitor credit card and bank accounts regularly and to take advantage of monitoring programs offered by financial institutions. 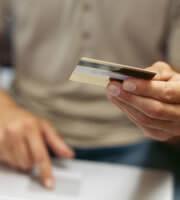 Don't wait for your credit card statement to arrive by snail mail to check activity. Go to your credit card's Web site, create a password and start monitoring your credit card use online. The more frequently you check your account statement, the more quickly you can respond to fraud. Experts recommend checking your account at least once a week. Frequent monitoring also helps with tracking spending to stay within a budget. Javelin found that 43 percent of all reported identity fraud cases are spotted by consumers monitoring their accounts, and consumers who use electronic methods to detect fraud experience lower average out-of-pocket costs than other fraud victims. Credit card companies offer services that send you alerts by e-mail or cell phone text anytime your credit card activity is unusual. All you have to do is sign up for the alerts and set the criteria. For instance, you might want to be alerted if your credit card is used to make cash withdrawals or to purchase something over a certain dollar amount. If you didn't make the transactions, you'll know that something fishy is going on and can report it immediately to your credit card company. Get copies of your credit reports from each of the three major U.S. credit reporting bureaus from AnnualCreditReport.com. You're entitled to a free annual report from each bureau. Checking your credit reports enables you to spot whether anyone has opened phony accounts in your name. Call the credit bureau and the reporting financial institution if you see anything out of order. 0 Responses to "Credit Card Fraud Detection: Three Easy Steps to Speed Up Your Response"